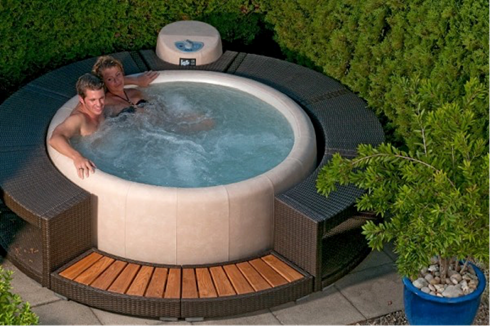 This Softub is an ideal size and shape to accomodate 4 people. The Legend will provide the ideal family size spa. Our tubs are not the cheap blow up variety, they are soft, comfortable and excellent quality. You are getting a £5000 hot tub delivered to your door! Please note:- Standard hire does not include the rattan surround as shown. This is available to hire with the 5/6 person Resort Softub. 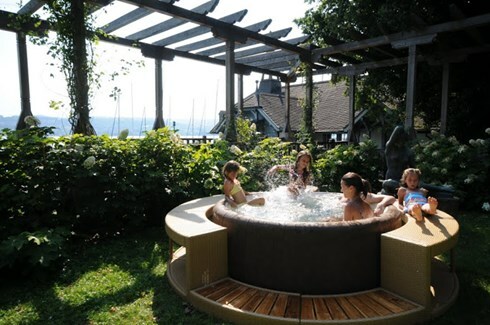 The ultimate in Softub luxury – the 5- 6 person Resort. Providing massage and therapy for up to 6 people, this model offers all you need for that wellness experience! With this model you are getting the benefits of £6000 worth of kit! Please note standard hire does not include the rattan surround as pictured, but this can be hired subject to availability and additional cost. We can supply and you a good quality 3 metre X 3 metre pop up gazebo if you fancy been undercover. This is available with either of the above tubs at just £30 per hire! If you would like to book a an Epic hire experience then please either call to confirm availability or send us an e-mail. Once we have confirmed availability you can either download the booking form and return to us or we can e-mail one to you. We will normally take the security deposit on booking either by cheque or bank transfer. We will then take payment for the hire on delivery day by either cash, card or bank transfer. Our hot tubs are unique in the way that they heat the water. The motor unit does not have a heater like most hot tubs, but will still heat up to 40 degrees! When the motor runs it generates heat, which is recycled to heat the water, making it the most economical hot tub in the World. The concept of Softub is it is barrier free seating, meaning you can position yourself however you want without been conformed to a formal seating position. The Resort Softub does have a seat with two back jets. From filling it cold it will take between 24 and 48 hours to heat, depending on the model and time of year. We always deliver two days before your hire starts. Once up to temperature the motor will maintain your selected temperature. The cost of running a Softub is about £3 per week! 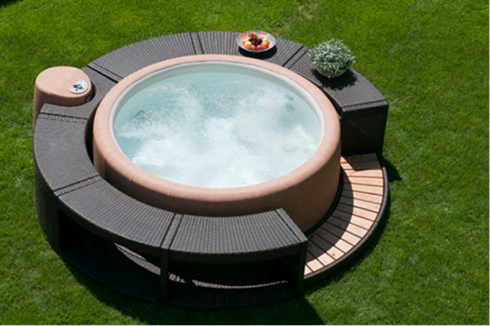 Softub spas offer individuality, environmental friendliness and maximum flexibility. All in all a great way to relax and unwind from the stressful hustle and bustle of everyday life. Lightweight, easy to use, simple to install: Since Softub is the world’s most portable spa; there are no limits as to where. When it comes to comfort and relaxation, Softub spas can’t be beaten. The soft but firm Polybond foam interior makes the Softub as cosy and comfortable as a leather sofa however you choose to sit and itâ€™s even easy to get in and out of – so you can be sure to make a glamorous entrance!